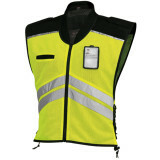 Niles - Niceville, FL Cheaply made and not well sized "This vest is not made well and will not last long...cheap plastic zippers, thin material, Velcro straps are barely adjustable. The zipper is on left side rather than standard right side. Fits like a large to XL rather than S/M. Way over priced for the quality. Do not buy this vest!" 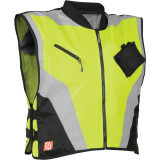 Milano30man - Lawton, OK, USA Vega Motorcycle reflective vest "Great Quality vest with side elastic cords that have some give to fit over jackets. Velcro clear pocket great for displaying access ID for military bases without having to stop and take gloves off. Clear case can be detached if need be and Velcro-ed back in place with little fuss. Can be scanned through clear cover with RFID card readers."